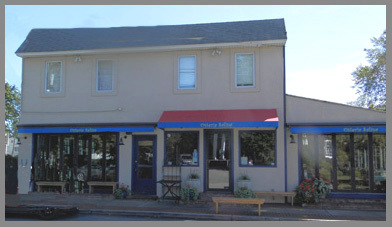 Osteria Salina, located in Bridgehampton, New York is owned by the Gaglio family (Timothy, Cinzia, and their sons Claudio, Gabriel, and Tim) where the focus is on Sicilian cuisine from the "isola di Salina" (island of Salina) section of Sicily. 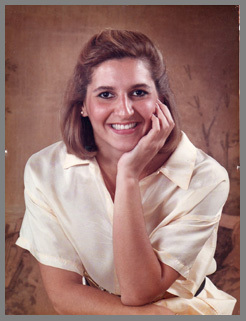 "Mama" (Chef Cinzia Gaglio) is in the kitchen cooking, and you will definitely "mangia bene" here, we did. An attractive restaurant with a comfortable ambience, stellar food, and attentive service, make this a little gem to try on your next visit to The Hamptons. 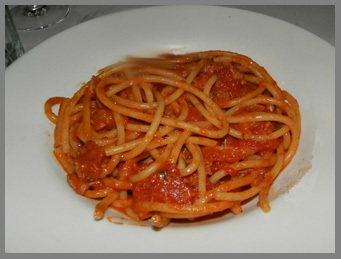 In Italy, an osteria is a small restaurant that serves local specialties and drink; in Bridgehampton, Osteria Salina, which opened in May 2012, continues the tradition focusing on Sicilian specialties from the "isola di Salina" (island of Salina) section of Sicily while deftly incorporating fresh seafood from Long Island to create a perfect marriage. We had an excellent dinner at Osteria Salina in mid-September 2013, where tables dressed with saffron colored tablecloths, white paper, and candles spilled out onto the sidewalk for diners reluctant to come indoors and wanted to enjoy al fresco dining on one of the waning nights of summer. Although the tables looked inviting, we opted to dine indoors, where Sicilian hospitality was present from the moment that we entered the restaurant. The ambience was at once warm, inviting, and gracious, a combination of casual chic without artifice. The focal point of the restaurant is the welcoming rectangular bar in the center of the main room flanked with high backed black stools with leather seats, which was teeming with patrons, their conversations flowing as easily as the wine. The restaurant has two dining areas, in the bar, and in a separate room where the saffron walls are accented with black wainscoting. We opted for a table in the bar to watch the action, where Sicilian pottery and paintings graced the walls, and wine bottles hung horizontally creating both functional and decorative appeal. Red leather banquettes lined the walls and black metal slatted chairs with colorful cushions flanked the tables dressed with saffron tablecloths, white paper, and votive candles in amber colored glass holders. Recessed lighting in the wood paneled ceiling complemented the wood flooring adding to the overall soft ambience. 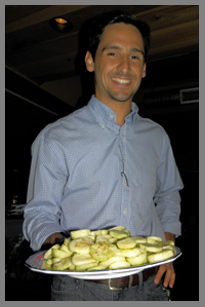 Comfortably seated, Claudio Gaglio welcomed us with a delicious cucumber salad to enjoy while we perused the menu. Crusty Italian bread followed accompanied by small bowls of Sicilian olive oil and sea salt. The menu focuses on inspired Sicilian specialties with rich combinations of ingredients, flavors, and textures, with the menu sections and items written in Italian with English descriptions, along with several nightly specials. 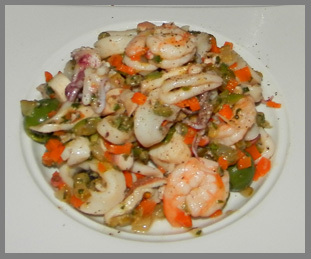 To begin, Edward selected the Insalate Frutta di Mare which was one of the night's specials, a tasty salad of a mélange of polpo, calamari, shrimp, scallops, with diced celery, red onions, and carrots; the seafood so fresh they still had the taste of the sea on them, which he paired with Chianti Classico, Roccie della Macie, 2006, from Tuscany. 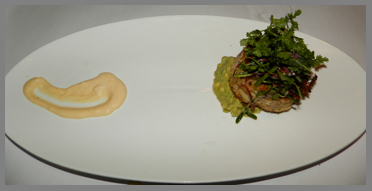 I had the Tortino di Granchio, which was a generous lump crab cake that was seasoned crab perfectly cooked to create a golden crust, topped with micro herbs, on a bed of mashed and seasoned avocado, accompanied by a swirl of citrus aioli, which I paired with "Anthilia" Catarratto & Inzolia Donnafugata, 2011, from Siciliy. Continuing our Sicilian discovery of the Primi section of the menu, Edward had the Bucatini All'Amatriciana, also one of the specials, which was pasta served in a rich sauce of fresh cooked tomatoes, onions, and pancetta. From the Secondi section of the menu, Edward had the Spada alla Piastara, which was grilled fresh line caught swordfish on a bed of room temperature caponatina Siciliano which was a delectable blend of diced eggplant, tomatoes, golden raisins, celery, agrodolce, red onions, and pine nuts marinated with Balsamic vinegar. 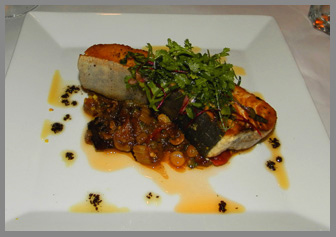 The swordfish was moist and flavorful, and paired with the caponatina, it was truly spectacular. 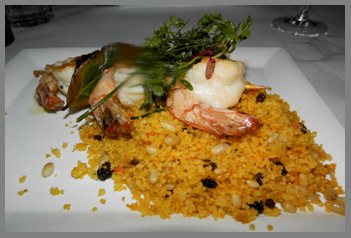 I had the Gamberoni con Couscous, which arrived as three grilled jumbo shrimp on a bed of saffron couscous studded with pine nuts, currents, and orange zest. This was another winning combination of flavors, textures, and culinary styling. 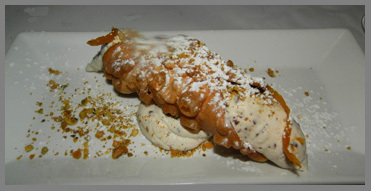 We ended our evening with "dolci," for Edward there was the Cannoli Siciliani, which was a large crisp and delicate shell filled with a delectable mixture of cow's milk ricotta cheese, chocolate, and pistachio powder. For me, there was Torta degli Angeli (angel's cake) made with a heavenly blend of cow's milk ricotta cheese, mascarpone, and caramel. 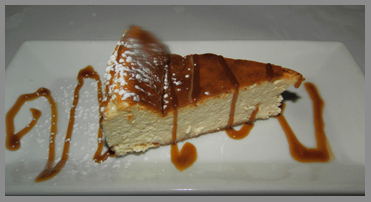 The blend of ricotta cheese and mascarpone created a lighter, but very tasty version of a crustless cheesecake, and drizzled with caramel, it was a hands-down favorite. 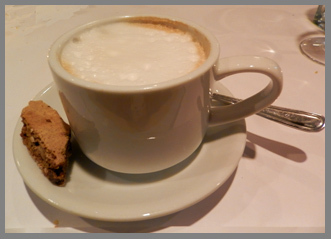 We finished our evening with cappuccinos accompanied by almond studded biscotti. Although in Italy, cappuccinos are for morning, we opted to enjoy them instead of the more appropriate espressos, as we wanted to prolong our evening and savor the moment at Osteria Salina. Read more about The Hamptons in the Destinations, Hotels and Resorts, and Restaurants sections.